Maybe, but likely in a different way than Facebook or LinkedIn. You really have to use Twitter to understand the difference. Whereas connections on Facebook and LinkedIn tend to be a lot more socially meaningful, that does not necessarily seem to be the case on Twitter. “Following” or “following back” someone on Twitter does not really create a social relationship, at least not one with a clear purpose. However it does clutter up your newsfeed with a barrage of updates that you may not necessarily care about. And this is where I think Twitter’s problems start. I do think Twitter is a very useful tool as a publishing platform, to push your updates to the world in a unique format. Perhaps the overwhelmingly unidirectional updates are best distilled by a machine rather than an individual at the receiving end. 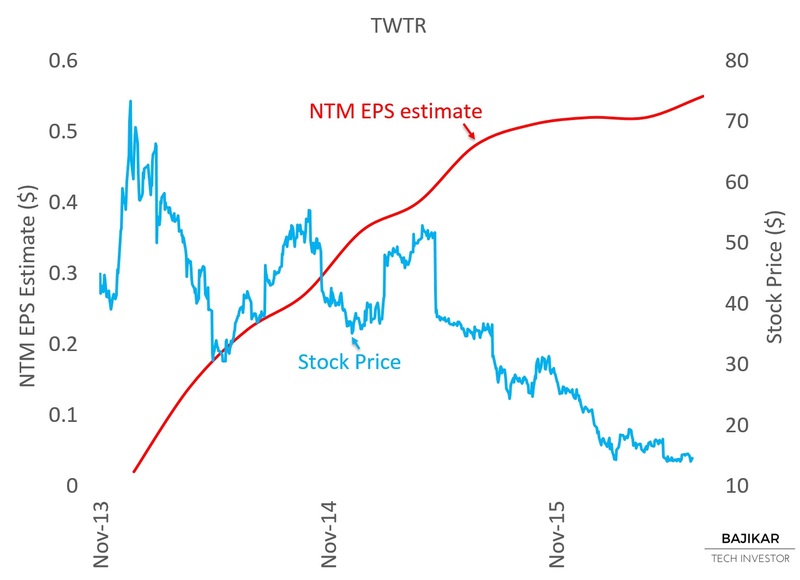 The chart illustrates the divergence between TWTR stock price and NTM EPS estimates, leading me to question whether those NTM EPS estimates are correct or sustainable. The next chart sheds some light on the disconnect. Monthly active users (MAU) haven’t really been growing rapidly for a couple of years, and user engagement (~85% of users are on mobile) on Ads seems questionable. YoY revenue growth has been declining, although still in the ~20% range, apparently helped by increased monetization per user. The question is whether Twitter will be able to deliver compelling value to its customers through an improved U/I in spite of potential lack of sufficient “social insight”. Investors have been concerned about management churn, and management has been upfront about acknowledging some of the problems with the platform. If the business model, which revolves around advertising, is at risk, then a valuation discount (if it exists) loses meaning quickly. One major catalyst that investors are anticipating for 2H16 is from Twitter’s deal with the NFL. In a bull case scenario, the deal has potential to lift Ad revenues, and perhaps generate some excitement to stimulate MAU growth. The upcoming presidential election represents another potential catalyst in 2H16. It is understandable then that there might be some level of “takeout premium” built into the stock price, as investors anticipate Twitter being a potential beneficiary of LinkedIn’s recent acquisition by Microsoft. Speaking of updates worthy of a machine’s appetite, I do think that a learning machine might be able to extract various insights from the multi-dimensional live information published on Twitter. This might be already happening to some extent through engagements with IBM, Google, Fintech startups, and potentially others. So I do think the publishing platform holds real economic value. 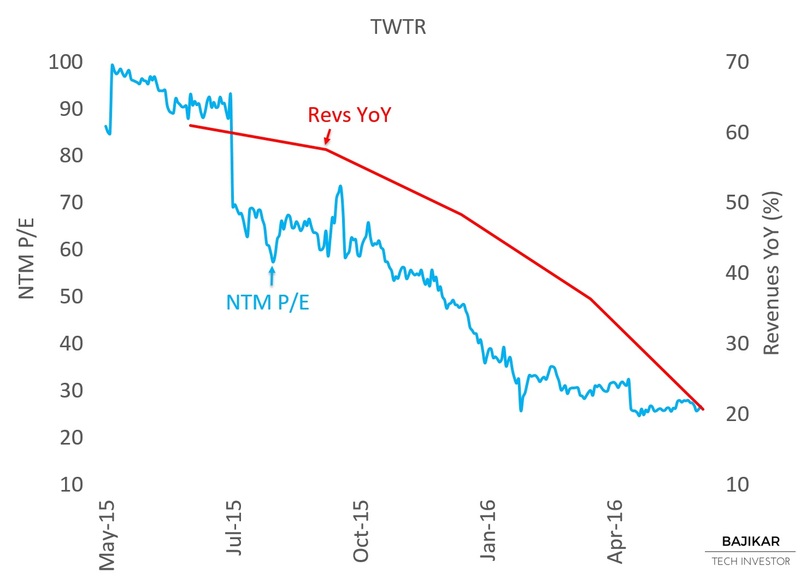 But would a sophisticated acquirer really value TWTR as a social network? Broadly speaking, what happens to a social network’s valuation when user growth slows or stops, or if the “social connection” fades or doesn’t exist? How many social networks do us humans really need to stay connected with everyone or everything that we care about? 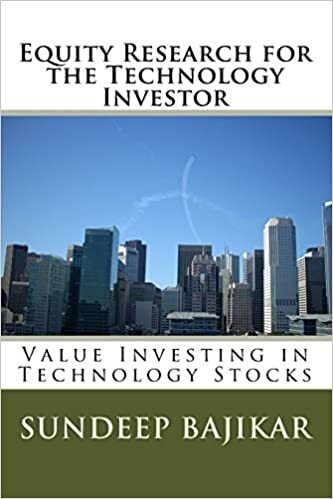 Disclosure: As of this writing the acteve Model Portfolio did not hold any positions in TWTR, LNKD, FB or IBM, but held long positions in GOOG, AAPL and MSFT.